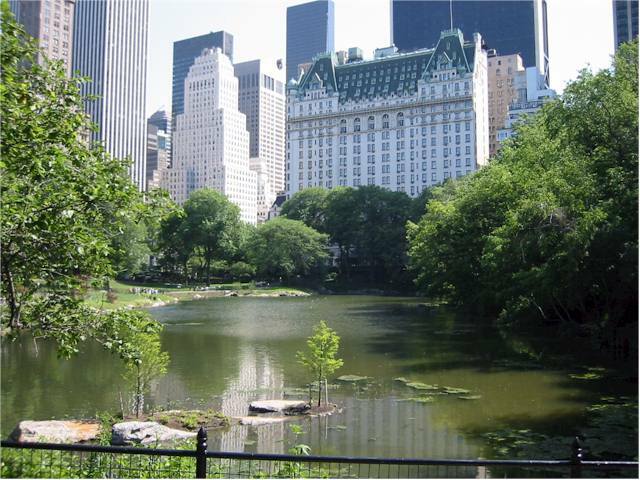 In Central Park about 4 blocks from the Show. Copyright � 2002 Audio Federation, Inc. This is a highly opinionated review - this is what *we* heard. So *please* do not be offended if *your* favorite component did not sound right to *our* ears. For better or worse, we are stuck with (to) these ears, just as you are yours. 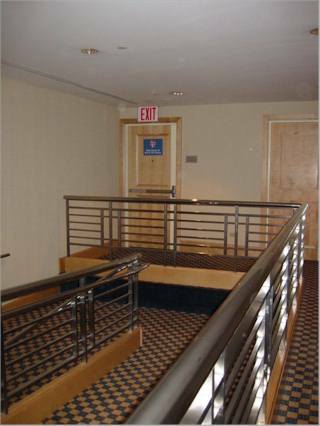 We (my wife and I) stayed at the New York Hilton hotel, Midtown Manhattan NYC, the site of this year's show. 2 block in one direction is Radio City Music Hall (where the Tony Awards were held the day following the show), 2 blocks in the other is Carnegie Hall. Ah, life in the big city. We found the natives to be very alert, intelligent and friendly and we enjoyed our stay immensely. The first day (Thursday) was the least busy, with Friday and Saturday having at least twice as many people. Sunday was somewhat calmer. The last day (Sunday), was the last day and the day during which it was easiest to get one's own CDs played. There seemed to be a distinct preference for exhibitors to play audiophile-quality music - some even had completely 'canned' playlists and refused to play anything else (Sound by Singer, TacT). Ole Lund Christensen (GamuT, more later) played selections from Pink Floyd, the Wall, a few times which created a real buzz. 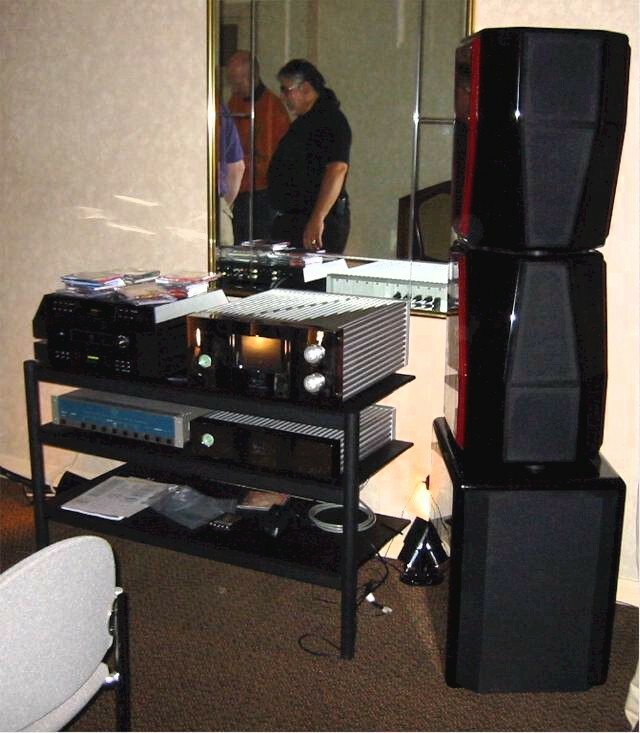 Some general themes at the show(s) were: More turntables (especially Clearaudio) being played than at CES 2002, lots of DSD mastered CDs, a number of the higher-end rooms had Rix Rax equipment racks and Aesthetix equipment. Many rooms were setup by dealers, as opposed to just manufacturers and distributors (for the most part) at CES. One of our goals at the show was to hear state-of-the-art systems and compare them, in time and space, with our current system to determine just where we stood in terms of overall performance. An additional goal was to hear various lines of equipment and determine if there was something out there that we just 'had to' have. This was much more difficult than just evaluating high-end full-range speakers, like we did at the last CES. There are too many variables. For example, one could get a real sense of what the Pipedreams sound like, by hearing them in 2 completely different rooms and systems (all GamuT, tiny room and Audio Aero, Tenor, large room). But trying to evaluate the, say, GamuT CD-1 CD player against the Audio Aero Capitole mkII? The Audio Aero was overwhelmed by the character of the Tenors. The GamuT was piped through a totally unfamiliar GamuT preamp. That being said, we did come away with impressions that we wish to share here. One more thing. 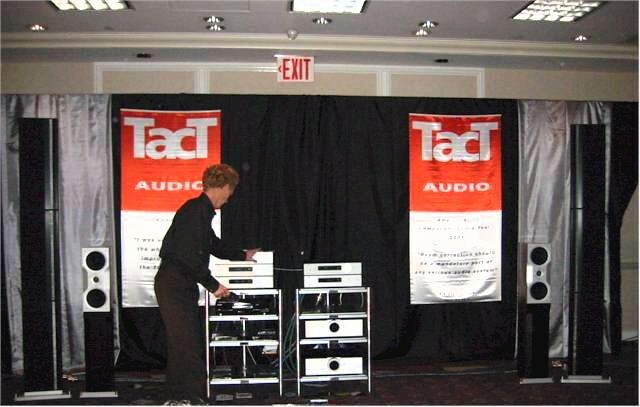 We should have learned this at CES 2002, and we were better at it at HE2002, but we really need to go back to 'awful' sounding rooms multiple times, because sometimes the exhibitors are able to 'fix something' that makes the sound during our subsequent visits much more pleasing. Many of the rooms, especially the second day (Friday) played their systems WAY too loud. We now know what Pipedreams and Lumenwhites sound like when they break up when over driven. How nice. 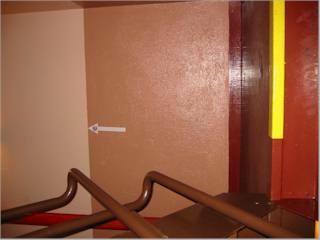 But we did like it when the rooms had literature describing the components-in-play. Prejudices: We like lots of detail, bass, soundstaging, dynamics all with the correct timbre. We do not rule out (or in) anything based on price. This is a highly opinionated review - this is what *we* heard. So *please* do not be offended if your favorite component did not sound right to *our* ears. Sanibel (5 Piega P5s, Aloia,...). Compressed. Timbre was not correct. [Caveat, we did not go back after the first day]. Dynaudio (new $16K speakers). Imaged well and deep soundstage in the smallish sweet spot. The bass seemed boxy (trapped within the speaker, some resonances). The Wilson Watch Dog stage left of the Watt/Puppy 7s. Innovative (NYC) (Watt Puppy 7, Watch Dog, 4 VTL monoblocks). [1st day] The speakers completely dissapear and image quite well. Neutral but not cold sounding. Tiniest bit bright sounding, the slightest bit compressed at the end of each note. Slightly over the top (prominent) midrange still there (the Wilson sound). Timbre very slightly off. [2nd listen, Manley amplifiaction] Great, tunefull and detailed bass. Still problems in the highs with the brightness/beamyness/forwardness. Disappears and images very well. Macrodynamics not compressed. The WP 7s are quite an improvement over the 6s. The WatchDog is quite a beast. Very nice, detailed, extended bass with the slam one expects from Wilson. 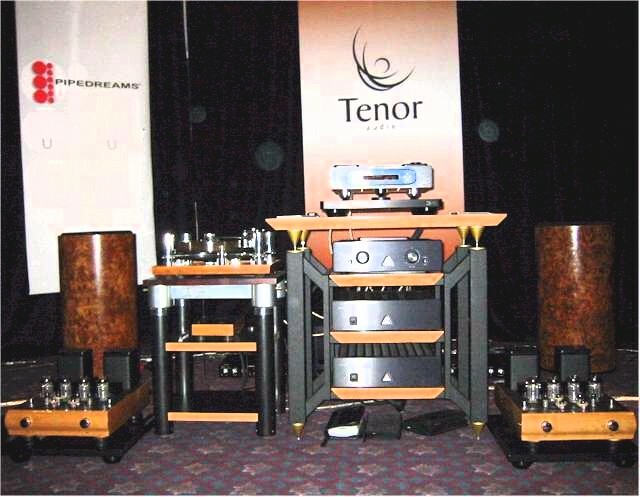 The Pipedreams/Tenor/Audio Aero/Rix Rax room center stage. 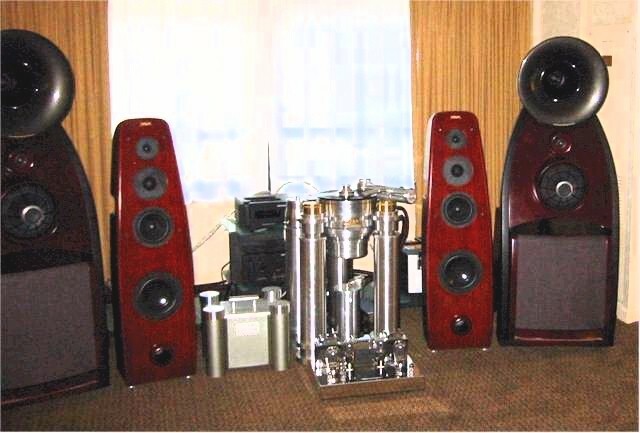 (7ft Hemisphere Pipedreams, Audio Aero Capitole mk II, Tenor 75w amps, Silversmith (paladium) cables, Rix Rax). [1st day] Good sound, great bass. Imaging outside the sweet spot suffered quite a bit. [2nd listen] My theory about the pipedreams: Midrange energy is so full and open and detailed in a wide band on these speakers - I think this is what lends them their charm. Outside this band, and outside that supported by the subwoofers, is not handled as well (or perhaps even badly) - but these areas are in those areas (many of) our ears easily overlook. [3rd listen] Take 5 - bass somewhat muddy, head in a vise imaging, but nice big sound. The Rockport Antares and Halcro dm68 amplifiers. The Rockport/Halcro room Rix Rax with Clearaudio turntable, Aesthetix phono stage and Marantz SACD-1. (Rockport Antares, Halcro dm68 amp, Halcro dm10 pre, Aesthetix IO signature phono stage, Rix Rax, Clearaudio master reference turntable, master TQI tonearm, Insider Reference Wood cartridge, Marantz SACD-1). [1st day] Traditional hifi speaker sound. Many box colorations. [2nd day] Clearer, faster, than JM Lab Grand Utopias where we just came from. 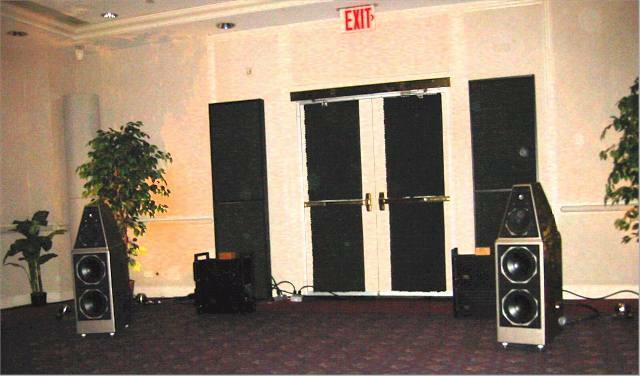 Soundstage slightly miniturized - otherwise fills the large room well, speakers disappear and image well. There is some kind of annoying compression in the lower mids, some kind of box coloration - very 'speakerish'. Day 2 sounded much better than Day 1 -- they must have changed *something*. [3rd listen] Neli was disappointed with the sound of SACD on the Marantz, as compared to the vinyl. Speakers still drop out in lower midrange (soundstage contracts, sound comes from speakers, resonance/congestion in a slightly wide band). (MBL) [1st day] Very, very nice. So why do we not like this sound more (we asked ourselves). Slightest bit sterile. A little closed in (not as dynamic and open as we like it). Essentially, it just doesn't sound as much like music or have as much of that 'emotional appeal' that we like. [2nd listen] 'Slower' sounding than Tenor/Pipedream system. GamuT (Pipedreams, CD-1, GamuT pre, GamuT D200s on pipedream subwoofers, GamuT S 600 M (M stands for Monster?)). [1st day] Plays loud well :-) Sweet, musical midrange. Bass not as detailed as some. [2nd listen] Still very nice. Imaging nice on classical music - minimal compression/congestion. Not as good as the Walker/Kharma exquisite combo at CES... but nice. 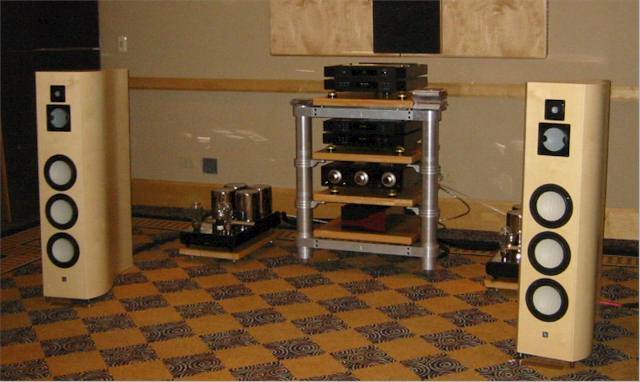 GTT Audio & Video(Kharma Ceramiques 3.2, Lamm ML2 amps, Lamm L2 pre, CEC TL1X transport, dCS Elgar Plus DAC). [1st listen] PRaT, emotive, but compressed bass (especially on lower-register piano keys). [2nd listen] Ignore the very compressed bass and it was pure music. Neli wished that they brought some of the bigger Kharmas even though the system fit the small room rather well. (Impact TEchnology Airfoil 5.2, BAT VK-75SE amp, BAT VK-50SE pre, BAT VK-D5SE CD player, Cardas cabling). Compressed sound. Muddled. Lots of resonances. One JM LAB Grand Utopia and its two Lamm ML1s. Sound by Singer (JM LAB Grand Utopia, 4 Lamm ML1 biamping, Lamm L2 pre, dCS VERDI CD/SACD transport, dCS purcell/edgar, Synergistic Research cabling). Singer: "This is the best system there is. If you ever think you hear better, have your ears examined". Big, open sound overall, tonally accurate. Could have more detail/definition in the bass, not a lot of air. Interestingly: SACD sounded cold, forward, 'CD-ish'. Upsampled CDs sounded better. The Viola with 2 subwoofer modules and one midrange module. Viola speakers/system. Interesting concept of mixing and matching bass and midrange units. Sounded competant - didn't get a good grasp of what this system really sounded like. 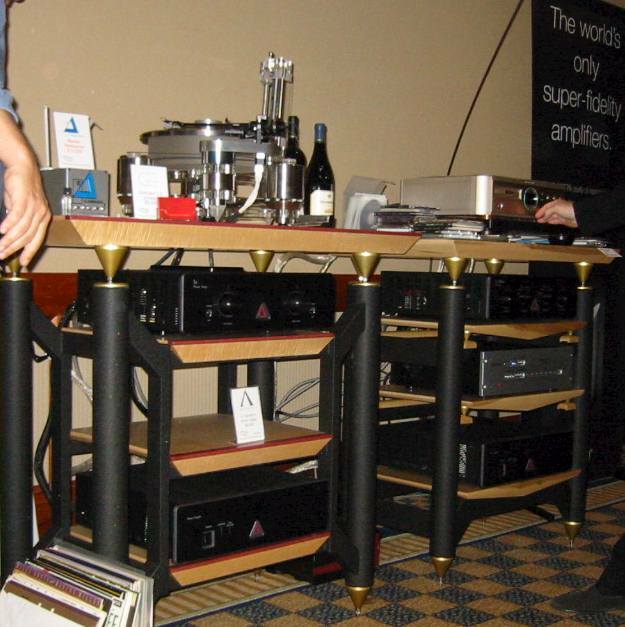 Stereophile's Paul Bolin was there and said he would try to get Stereophile to review them. 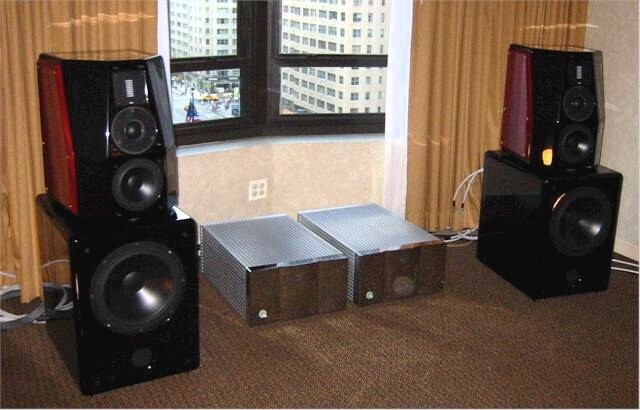 (Vandersteen 5, Ayre amp, Aesthetic pre, Ayre CX-7 CD player, Clearaudio Max Solution turntable). Clean, speakerish. Sound coming from a box - no illusion of reality. 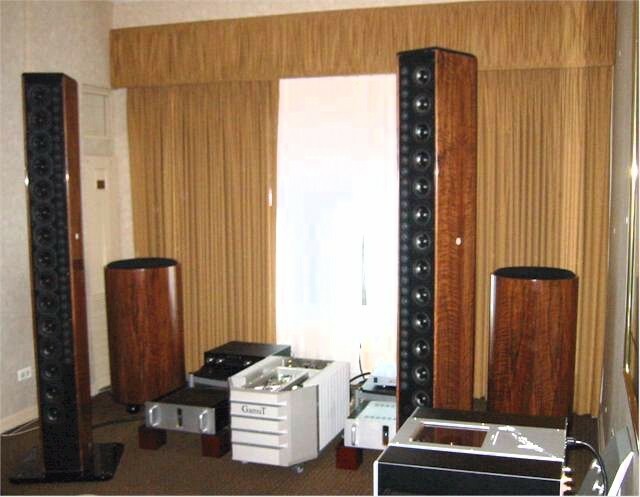 It is my thought that Vandersteen makes one of 2 or 3 best sounding 'speakers' there are, but that some speakers go beyond sounding like speakers. Did a direct comparison between CD and Vinyl. Vinyl won out by a large margin (PRaT, liquidity, bass, ...). Toys from the Attic (Eggleston Savoy, Andra II subwoofer, Andra center, Andra II in rear in a 5.1 channel configuration, CAT JL3 monoblocks, VPI TNT HR-X turntable, EMC-1 MkII CD player). [1st listen] Bass full, tunefull, controlled, lots of definition (this is in stark contrast to our experiance in the past with Andra speakers, most recently CES using Pass Labs amplification). CD player and turntable sounded much closer in quality that in the Ayre room. There was some congestion if more than one instrument was playing at a time. Still significant harshness in the upper mids. [2nd listen] played both the race scene from Star Wars Episode I and 2-channel music. There was a sweetness to the 5.1 sound that was in stark comparison to the Krell setup (see below). Speakers image and disappear well (but we were 4th or 5th row center - very far afield). SHARP KV-29000 DLP projector. Great picture, lots of depth. Very clear and colorful in a black-curtained section of the room. Some digital edginess though, and some actors appeared to be digitally rendered - like cartoons. The front and rear of the Krell Lat-1. 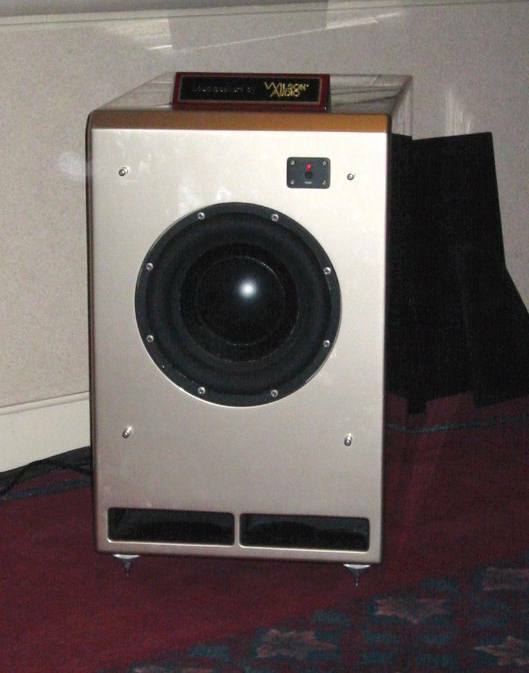 The Krell Master Reference Subwoofer. (Krell Lat-1 fronts, 4 Lat-2s side and rear, master reference subwoofer (120DB at 20hz), Fajoura). 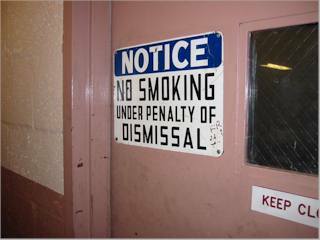 Can you say... ssssibilants? Ouch. 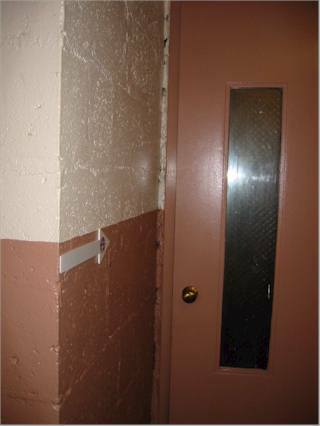 But the openness, air, and dynamics matched anything I have previously heard. Their speakers and sound seem very much to be in the 'Wilson tradition'. 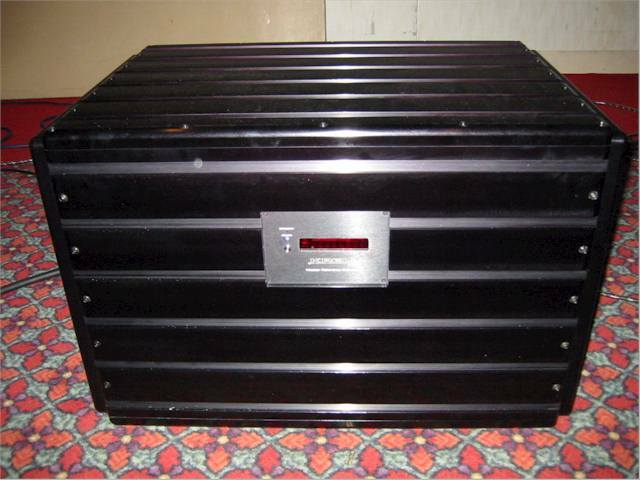 Another interesting, big, loud, deep subwoofer. 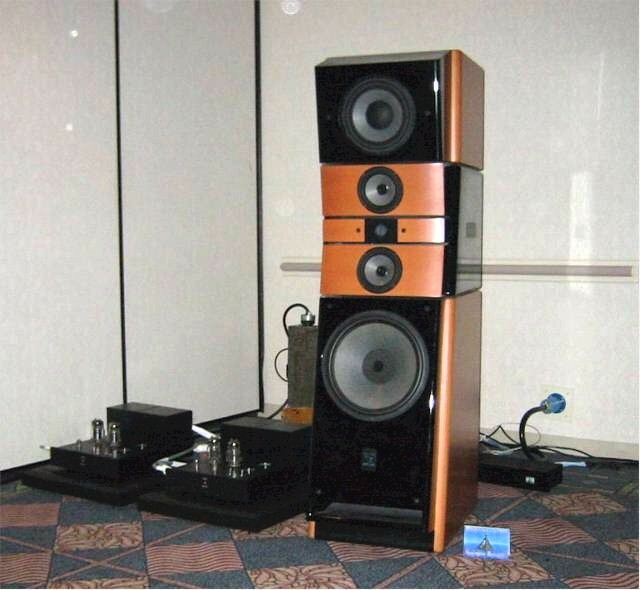 (Calix Phoenix speakers - various unrecognizable but cool-looking equipment). Compressed/muddled somewhat on massed instruments. But piano/violin duo sounded very, very real. Female voices were well rendered. Bass fairly detailed. This system had a 'signature sound' that is hard to fathom. Sometimes it is spot on, sometimes... not. 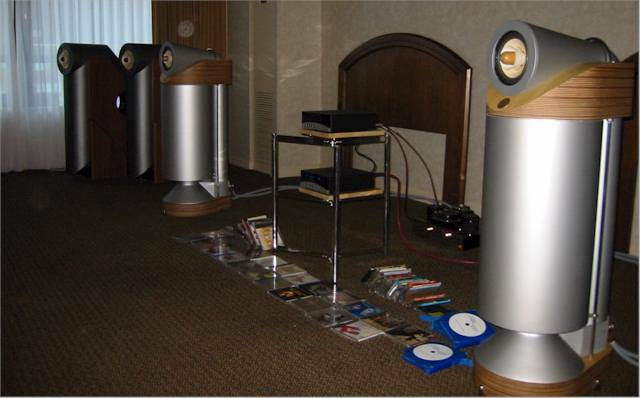 (Nordost demonstration). Swapped in and out all 5 lines of Nordost interconnect to illustrate their differences. Very educational. Most people seemed to get/hear the differences just fine. TacT (all TacT). Excellent approach to sound reproduction, impeccable implementation. But... sounded processed, not much air, not much definition in the bass, flat soundstage. It did not sound like music. It did not even sound like good hifi. Acoustic Dreams (Lumenwhite 'Whitelight', VAIC Classic 52-B Monoblocks amplification, dCS upsampling, dCS VERDI CD/SACD transport, Shunyata). Very crisp, clean, tonefull, quick presentation. Not as big and open as the bigger speakers at the show. Beautiful rendition of Spanish guitar. Legend Audio (The Legend?). Outside the door it sounded great, at least a drum solo did, very realistic for any size speaker. 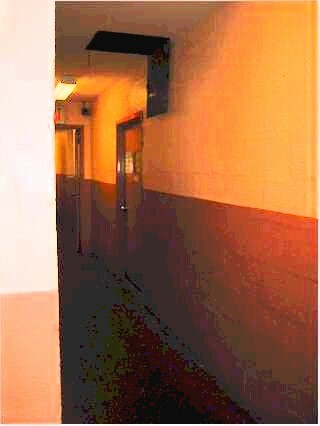 But 1. the room was always dark - so who knows what the equipment was and 2. it was very, very LOUD. Ear damaging loud. System Audio speakers, BAT equipment. Tiny speakers, big sound. More accurate than the Sonus Faber Electas, maybe not as sweet. We heard these right at the end of the show so only got to hear them once. Gershman Accoustics. The big boys are still boxy sounding. Merlin. 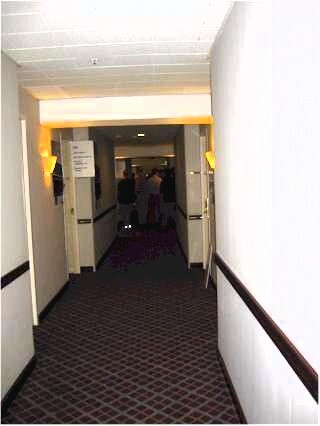 Both the rooms were nice - but we wished that Joule had chosen more detailed and fuller sounding speakers so that we could hear more what they - the Joules - sound like. Roman Audio speakers have a nice mid-range, while lacking in bass and air. 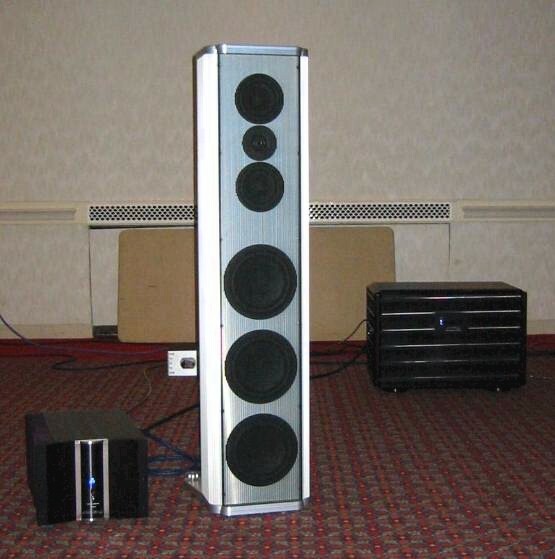 Chesky Audio speakers. Lots of midrange detail, also lacking in the bass department. FPS F1 speakers did not do it for us. May Audio Marketing (no website: 800-554-4517, mayaudio1@aol.com). Interesting selection of audiophile CDs: Chinese SACDs, test CDs, Wilson Audio, etc. Red Trumpet (www.redtrumpet.com). 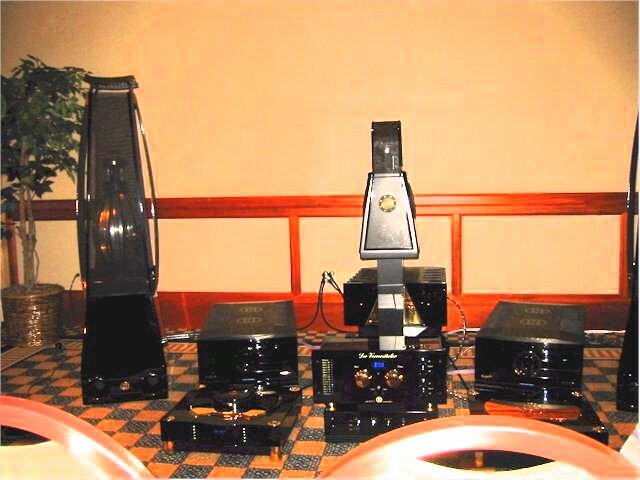 Audiophile CDs, LPs and equipment. Many popular DSD, 24 bit, millenium edition, Japanese import recordings (DSD Miles Davis, 24bit Wishbone Ash, King Crimson, etc.). Fully functional website. We had good luck with dining in NYC -- in direct contrast to Las Vegas. All these restaurants cater to both vegetarians and omnivores. As you can see, we prefer ethnic cuisine. Both of these East Indian restaurants are on 58th between 2nd and 3rd avenues. We had an excellant meal at each. If any of you are foodies, Madhur Jaffrey (cookbook author) consults on the menu at Dawat. Dawat is slightly more expensive than Chola. There is also a third East Indian restaurant in that block which we didn't try. Mascerram (Ethiopian) - 468 W. 47th between 9th & 10th avenues. Excellant food, perhaps the best collard greens on the planet. Probably the healthiest meal we ate in NYC. Very inexpensive. Very nice people. Topaz (Thai) - 127 W. 56th St. between 6th & 7th. Very good thai, and only 2 blocks from the hotel. We ate there twice. Fast service. Not fiery hot. not much selection, and food not worth the price. Neither one warrants a review. Recommendations for next time are gladly accepted. 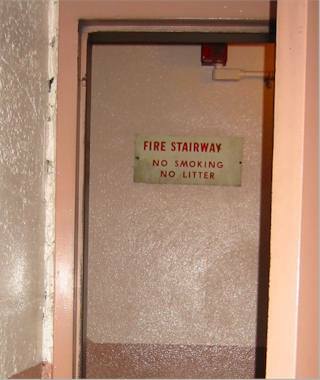 Maybe those arrows lead to audiophile hell instead of heaven... Hmmmm. Me thinks I will not go exploring just now... Ah! 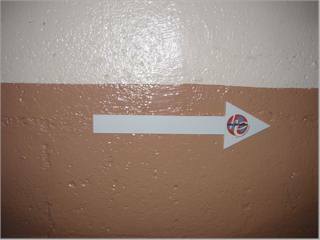 Another arrow. Maybe not all is lost. OK. We are lost, forever lost... Another HE2002 arrow. We are saved! 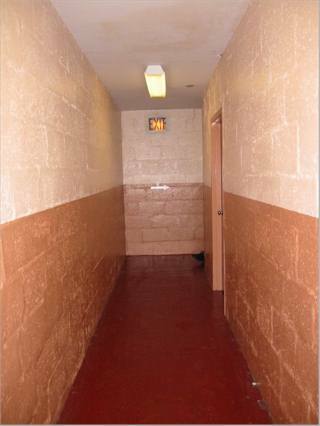 Floor 6. There be audiophiles here! Heaven or hell, we are not alone. Every system had something that was not quite right, nothing stood out head-and-shoulders above another. So accolades goes to those systems that we were able to listen to and enjoy the music without being overly distracted by 'quirks'.